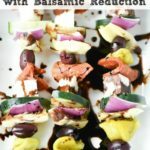 This Easy Antipasto Recipe: Greek Salad Skewers with Balsamic Reduction is an easy to make appetizer and great Super Bowl snack idea. For all my non football loving fans, I want to shout it out that my beloved Denver Broncos have made back it to the divisional championship game again for the first time since 2013. And once again, they’re set to face the New England Patriots. This is a big deal y’all – they are only one game away from making it to the BIG GAME! Unfortunately while they made it all the way to the said game in 2013, they didn’t win. I’m so hoping that this year is going to be different. This is their year to take it all the way! While I know some of my friends that don’t appreciate the game as much as I do, I know there’s one thing they do appreciate about football season. And that’s all of the amazing food that makes an appearance. We are down to the wire now and each and every football game counts. Long story short, it means that each and every game is all cause for a celebration and new and more fabulous food than the last game. 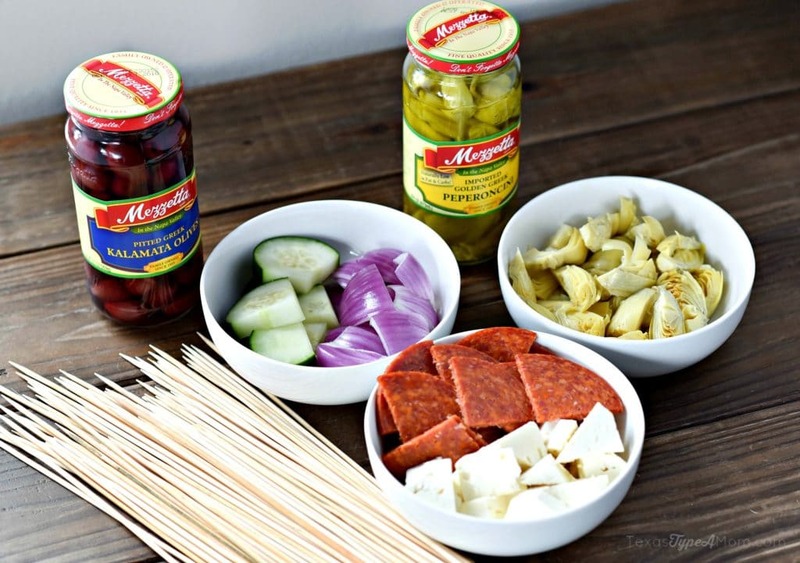 For this Sunday’s big championship game, I’m going to be whipping up an easy antipasto recipe. It hits on all the notes with the proteins, veggies, and fats and tastes as amazing as it looks. 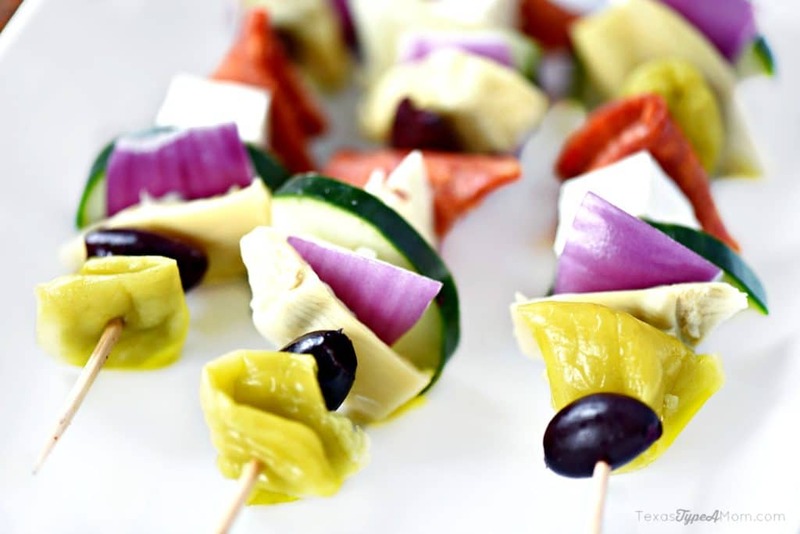 Deli sliced pepperoni, feta cheese, cucumbers, onions, artichokes, along with pepperoicini peppers and Greek kalmata olives turn this Greek Salad Skewers recipe into the ultimate game day appetizer recipe. Even my super picky littles love (most) of the ingredients in this recipe. This can be served with the balsamic reduction for an added dimension of flavor or without (as the littles eat it). These could be served in a huge party spread or made into a meal on a stick. 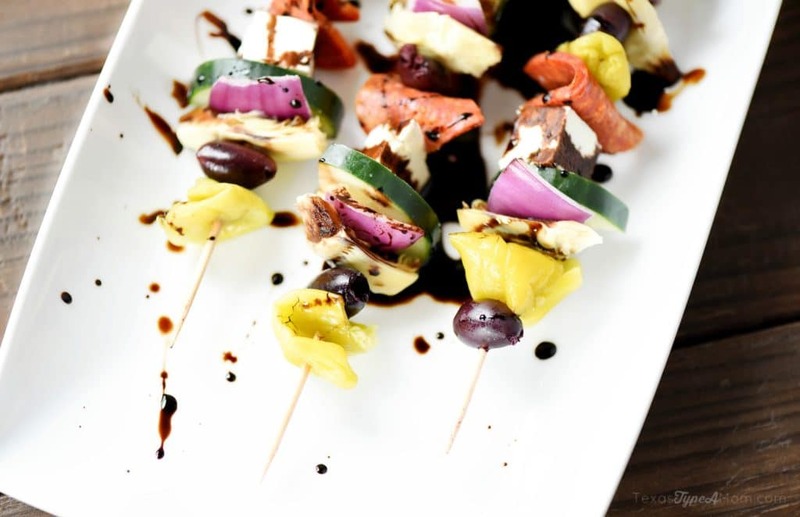 Using the pointed end, slide the ingredients of your choice onto the wooden skewer. Then repeat depending on the length of the skewer. To make the balsamic reduction, place the balsamic vinegar into a small saucepan over medium-high heat until it comes to a boil. Reduce heat to low and simmer until the balsamic vinegar has thickened and a spoon inserted into the liquid comes out coated. 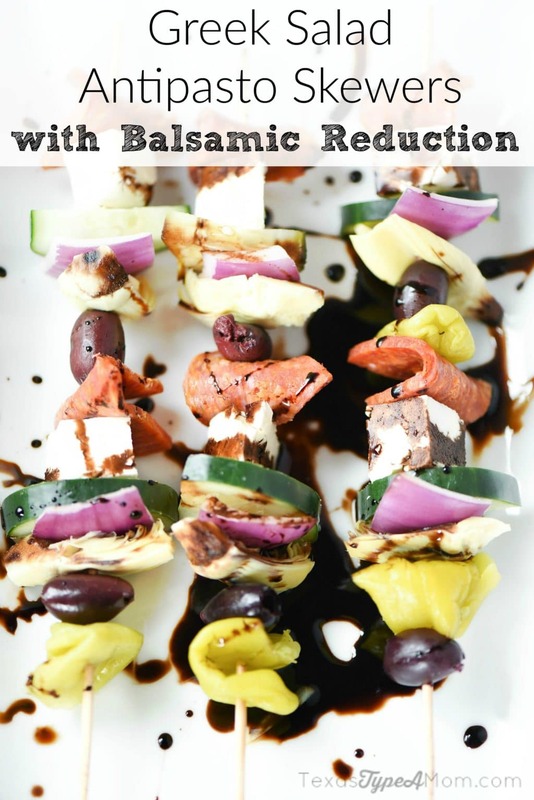 If wanted, lightly drizzle the balsamic reduction over the Greek Salad Skewers.